For the bedroom, living room, or home office, our Charlemagne Solid Wood Bookcase adds storage and display with recessed lighting to your home's interior. Display your literature beneath the recessed lighting found in our Charlemagne Wooden Bookcase. Beveled glass, framed by a selected hardwood, perfectly showcases and protects your most treasured items in this Amish bookcase. Additional storage is found within the four dovetailed drawer with undermounted, soft close slides. A double door cabinet adds an additional adjustable hardwood shelf. Customize your Charlemagne Bookcase by selecting wood, finish, and hardware from the options menu. 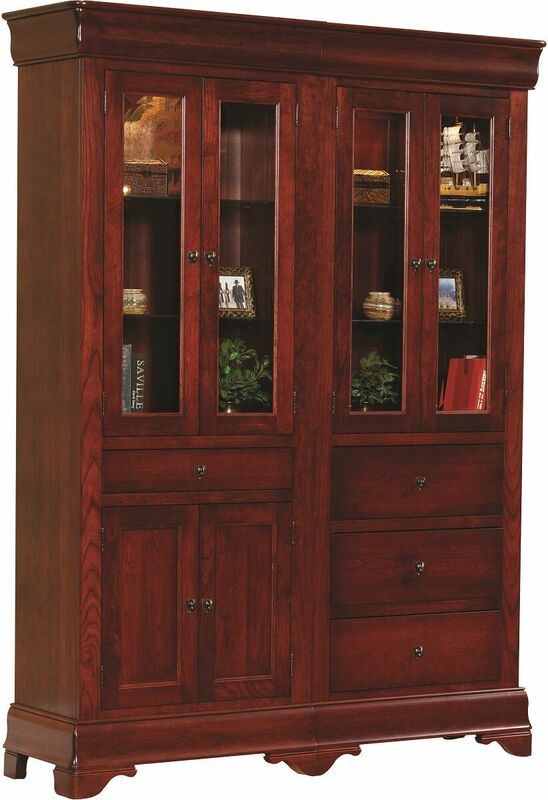 To obtain the pictured look on your solid wood bookcase, choose Cherry with with our hand-rubbed Mediterranean Fig wood finish.